(1) Plantronics H101 Encore Binaural Voice Tube Over-the-. Plantronics H101 Encore Binaural Voice Tube HeadsetP/N 43466-11. (It requires a Plantronics M22 Amplifier which is not included). canceling microphone. Spectralink PTH300 Headset. The PTH100 / PTH200 & PHT300 headset s fit the following Cordless Phones Plantronics H141 DuoSet Voice Tube Headset. Model DuoSet H141. Spectralink: LTB100, LTB6020, LTB6030, LTB8020, LTB8030, BPL32, BPL100, BPL200, BPL300. Armor P/N ARRIND. SKU ARRIND. MPN ARRIND. 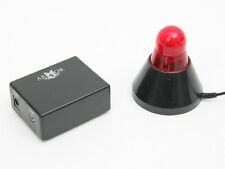 It has a bright red indicator light and is small enough to mount almost anywhere. Bright red indicator light informs others you are on a call. Wireless Technology Wired. (1) GN Netcom GN2010-ST Mono SoundTube QD. (1) Jabra Link 850 Headset Amplifier 850-09. Jabra Link 850 Amplifier – 850-09. Earpiece Design Ear-Pad (On the Ear). Earpiece Single. Fit Design Headband. It magnifies the sounds coming into the microphone so that your employees' voice carries with maximum clarity. The result is better call clarity on both ends of the call. Jabra Biz 2415 / 2400 Duo Omni Directional QD HeadsetP/N 2409-320-104. Jabra / GN Netcom Biz 2400 Duo Omni Directional GN2415. It requires a Jabra Link 850 amplifier which is not included. It requires a GN9330 battery 14151-02 to make it work. GN Netcom GN9330 Spare Headset Top without Battery P/N 91-0135. One GN9330 Spare Headset Top without Battery. 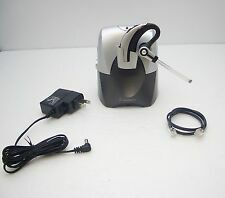 One GN Netcom GN9330 Wireless Headset Top without battery. Communicate in style and unmatched comfort with the Plantronics CS70 Wireless Headset System. Leading-edge, voice-dedicated DECT 6.0 (1.9Ghz) technology provides best-in-class audio quality, digitally-secure communications, and the lowest probability of interference with other wireless devices. Plantronics Blackwire 215 (C215) is a versatile affordable professional grade headset with a 3.5mm jack. It's also foldable for easy travel or stroage. (1) Plantronics Blackwire 215 C215 3.5mm Mono Headset. Polycom SoundPoint Pro SE-220 & SE-225 conference Phones. Cisco Linksys SPA303G, SPA501G, SPA502G, SPA504G, SPA508G, SPA509G, SPA525G, SPA921, SPA922, SPA941, SPA942, SPA962, SPA921, SPA922, SPA941, SPA942 IP Phones. (1) Plantronics H161N DuoPro Noise-Canceling. Plantronics H161N DuoPro Noise-Canceling Headband Headset P/N 61146-01. Plantronics H161N DuoPro noise canceling headset is the most. The H161N features an over-the-. Jabra GN9350e. Jabra GN9330e. Jabra Earhook # 14121-02 is spare earhook designed for the following Jabra/GN wireless headsets. (While supplies last). Compatible Jabra - Gn Netcom headsets Jabra GN9330. (1) Plantronics HW111N Polaris Monaural Over-The-Head Noise-. HW111N Polaris Headset. Plantronics HW111N Polaris headsets require no amplifier! The most popular headset in the world, the HW111N Headset owes its popularity to the perfect balance between light weight, superior sound and outstanding comfort. (1) Plantronics SP12 Binaural Noise-Canceling Headset. Plantronics SP12 Binaural Headset CTA-100 Amplifier System. Plantronics SP12 Binaural Noise-Canceling Headset CTA-100 Amplifier System. Includes an over-the-head stability for convenience,a noise-canceling microphone for superior sound clarity. (1) Plantronics SHS1890-10 6-wire Push-to-Talk Amplifier. Plantronics SHS1890-10 is a Push-to-Talk headset adapter for use with many 6-wire applications. Type Headset Amplifier. PJ-7 (equivalent to WE-425) connector. Plantronics W440/A-M, Microsoft Office Communicator/Lync compatible wireless headset. The first portable DECT™ headset system now includes the lightest headset on the market – the Savi W440/A-M. Enjoy your choice of three ultra-light wearing styles and wireless freedom to multi-task up to 300 feet from your desk. (1) Jabra BiZ 2400 Mono MS / Lync USB. 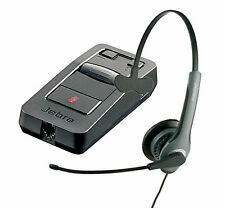 Jabra Biz 2400 Mono MS / Lync USB/Bluetooth Stereo USB Headset P/N 2496-823-105. Microsoft Lync. Optimized for Microsoft Lync 2010 and Microsoft OCS 2007. Jabra BIZ 2400 MS Mono USB headset is Microsoft Office Communicator/Lync optimized. PBX and ACD operators can enjoy the comfort and convenience of Plantronics' technology with the Plantronics P10 plug prong adapter. Just plug the P10 adapter into your operator console, PBX, or ACD, then plug in your headset. (1) Refurbished Plantronics CS55. Plantronics CS55 DECT 6.0 Wireless Convertible Headset System P/N69700-06. When you’re away from your desk, you're still in touch to think and talk on your feet, either answering or ending a call with the touch of a button with the optional Plantronics HL10 Lifter. GN-5140 Headset System. 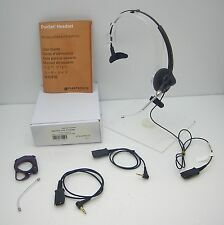 Type Headset System. Black / Silver. Color Black / Silver. Fit Design Headband. Lot of 10 Jabra / GN Netcom P/N 1004831 Computer. Jabra / GN Netcom P/N 1004831. You are buying (10) new Jabra / GN Netcom P/N # 1004831 Computer Soundboard Cable to Quick Disconnect. Part Number: 1004831. (1) New AddCom ADD800 Monaural Over-The-Head Headsets. AddCom ADD800 Monaural Noise-Canceling Headset with Quick-Disconnect. MPN ADD800. Model Performance Plus II ADD800. Polycom SoundPoint Pro SE-220 & SE-225 conference Phones. (1) New AddCom ADD880 Binaural Over-The-Head Headsets. AddCom ADD880 Binaural Noise-Canceling Headset with Quick-. 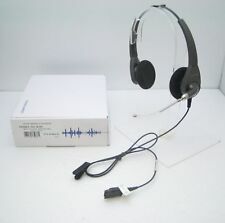 This AddCom ADD880 Binaural Noise-Canceling Headset with ADDQD-04 Cable is NOT compatible with Cisco 6921, 6941, 7940, 7960, 7970, 8941, 9951 IP Phones. Complete with U10P Polaris cord. Plantronics P101N-U10P Encore Binaural Polaris Noise-Canceling Headset. Binaural Noise-Canceling. (1) New PLANTRONICS P101N-U10P Encore Polaris. Plantronics P/N 33709-41 / 43467-02. (1) AddCom ADD330 Binaural Over-The- Head Noise-Canceling Headset. ADDCOM ADD330 Binaural Noise-Canceling Headset. MPN ADD330. Model ADD330. AVAYA / Lucent POLYCOM IP300, IP301, IP430, IP450, IP500, IP501, IP600 & IP601 IP Phones. Lot of (4) New Plantronics Voyager 500A Bluetooth. (4) Plantronics Voyager 500A Charging Bases. Adapter for Plantronics Voyager series and other Bluetooth headsets. Plantronics P/N 67891-02 / 67891-13 / 67891-14. GN Netcom GN 2010-ST SoundTube Monaural Over-The-Head Headset only. GN 2010-ST SoundTube Over-The-Head Headset. Flexible SoundTube boom. This headset provides added comfort with extra-thick, pivoting ear cushions and an over-the-head earpiece design. Plantronics T100 Headset Addcom A10L Headset System. (1) New Plantronics T100 Over-The-Head Headset. No Reserve! (1) Addcom ADD-A10L Base Adapter Amplifier. Toshiba DKT-2010S, DKT-2010SD, DKT-2020S, DKT-2020SD, DKT3210SD &. (1) New AddCom ADD220 Binaural Over-The-Head Headsets. AddCom ADD220 Binaural Noise-Canceling Headset with Quick-. This AddCom ADD220 Binaural Noise-Canceling Headset with ADDQD-04 Cable is NOT compatible with Cisco 6921, 6941, 7940, 7960, 7970, 8941, 9951 IP Phones. Plantronics Training Station Base (TSB, part# 40710-01) allows a supervisor to use Plantronics headsets simultaneously with trainee. Both the supervisor and trainee can transmit and receive. (1) Plantronics Training Station Base (TSB) Amplifier. Plantronics CS70N wireless DECT headset is now available in anoise-canceling variant - the Plantronics CS70N Noise Cancelling. It significantly reducing distracting background noise. Communicate in style and unmatched comfort with the Plantronics CS70N Wireless Office Headset System. Plantronics CS50, CS55, CS60, CS70, CS70N. For use with Plantronics CS50 ,CS55, CS60,CS70, CS70N, CS351N, CS361N, 510S & 510SL wireless headset systems. This HL10 Lifter with right angled plug for both CS and Savi Cordless Headsets. This part will not work on its own so only order this item if you already have the complete Plantronics CS50 system and only need to replace the headset itself. (1) Refurbished Plantronics CS50 Spare Wireless Office. Expand the connectivity options of your current Bluetooth headset with the BT300 Bluetooth USB adapter. Plantronics BT300-M Bluetooth USB Dongle for Microsoft Lync BT300M P/N85117-01. Optimized for Microsoft Lync and Microsoft OCS 2007. (1) New Plantronics SMH2018-01 M12 Vista Universal. Plantronics SMH2018-01 M12 Vista Universal Headset Adapter Amplifier P/N 92018-01. Plantronics H & HW series headsets. A Plantronics M12 AC Power Adapter is not necessary but is available as an optional accessory, otherwise it uses two AA batteries. Plantronics EncorePro 700 Digital Series HW720D Binaural Noise-canceling 6-pin QD Headset P/N 78716-101. Series HW720D Binaural Noise-Canceling. ThePlantronics EncorePro HW720D Binaural Headset will surely give you an excellent and satisfying features and functionality as well. Plantronics VistaPlus AP15 is specially designed specially for loud and noisy call centers. AudioIQ technology improves call accuracy by reducing background noise and keeping incoming calls at a consistent and comfortable listening level. (1) Refurbished Plantronics Voyager 510S Ear-Hook. Featuring exclusive Multipoint Technology, the Plantronics 510S seamlessly transforms into a powerful communication solution for up to two Bluetooth devices. ThePlantronics H261 Headset is a special binaural voice tube headset with HAC speakers (Hearing Aid Compatible). Designed for over-the-head comfort. Plantronics Vista M22 Audio Processor Amplifier. Binaural design (covering two ears). Plantronics CS50, CS55, CS60,CS70, CS70N. For use with Plantronics CS50 ,CS55, CS60,CS70, CS70N, CS351N, CS361N, 510S & 510SL wireless headset systems. This HL10 Lifter with right angled plug for both CS and Savi Cordless Headsets. Emotion H700 Headset with U10 Cisco QD Cable. This Emotion H700 Monaural Headset is not compatible with Cisco 7902, 7905, 7906, 7910, 7911, 7912 IP Phones. Model H700. Cisco System 6821, 6841, 6861, 6921, 6941, 6945, 6961, 7821, 7841, 7861. Plantronics P61N Binaural Polaris Supra NC Headset P/N26597-02. Plantronics P61N Polaris Supra headset is the most popular headset in the world, the Supra owes its popularity to the perfect balance between light weight, superior sound and outstanding comfort. Norstar M7208, M7310, M7324, T7208, T7316 &. Emotion H700 Monaural Noise-Canceling Headset with QD coiled cable. 6402D, 6408D , 6416D M, 6424D M, 8403, 8405D, 8410D, 8434DX. Avaya 2410, 2420, 4610, 4620, 5410, 5420, 5610. (1) New AddCom ADD800 Monaural Over-The-Head Headsets. AddCom ADD800 Monaural Noise-Canceling Headset with Quick- Disconnect. MPN ADD800. Model Performance Plus II ADD800. Quick Disconnect feature and QD plug allows you to walk away from the phone while still wearing your headset. Norstar M7208, M7310, M7324, T7208, T7316 &. Emotion H800 Monaural Noise-Canceling Headset with QD coiled cable. 6402D, 6408D , 6416D M, 6424D M, 8403, 8405D, 8410D, 8434DX. Avaya 2410, 2420, 4610, 4620, 5410, 5420, 5610. Plantronics EncorePro HW510V has a clear voice tube boom and is a single ear (monaural) over-the-head headset. It does NOT have a noise canceling microphone. HW510V ends in a Plantronics QD (quick disconnect), so it's compatible with all of the Plantronics bottom cables so it's adaptable to just able any phone or computer on the market. Jabra Biz GN Netcom 1500 Monaural GN QD Plug Headset P/N 1513-0157. (1) Jabra Biz GN Netcom 1500 Monaural GN Netcom. Built with noise cancellation technology to reduce background noise. Requires a Jabra Link 860 Digital Amplifier (or GN1200 smart cord ) depending on your phone. (1) Plantronics P251 SupraPlus Polaris Monaural Over-The-Head Voice Tube Headset. P251 Headset P/N 54390-01. Plantronics P251 Supra Monaural Voice Tube Headset with U10P QD Cable. One Plantronics P251 Supra Polaris monaural headsets require no amplifier! This is a stand-alone phone with standard features such as redial, flash and mute. (1) New Plantronics T110H Single-Line Feature. Plantronics T110H Part Number 79981-18. Model T110H. (1) Plantronics U10P QD Cable.